The Winchester Mystery House is a rambling, 160-room, unfinished and unfurnished house built by Sarah Winchester, heiress to the Winchester Rifle fortune. They don't allow visitors to photograph the Mystery House these days, so the images for this guide (which were taken before the ban) may some of the few glimpses you'll get inside it online. What's the Big Deal About the Winchester Mystery House? It's weird, and it's well advertised. In fact, this attraction is one of the best in San Jose about promoting itself and stirring up a buzz. The story is strange — and sad. The house is large beyond imagination, and it's just plain odd. You can read more about its history and Sarah Winchester's story on page three of this guide. The 55-minute general tour takes you from completed rooms into unfinished ones, making you wonder if the builders lost their place and started anew every day. The guides are knowledgeable, and some are even genuinely enthusiastic. You'll see all the things you've heard about and the oddities mentioned on the next page. Other tours take in the grounds and gardens or go behind the scenes. On Friday the 13th and just before Halloween, you can take a Flashlight Tour, which always sells out ahead of time. I rate Winchester Mystery House 3 stars out of 5. The standard tour lasts about an hour and costs almost three times what you would pay for a full-price movie ticket. Despite all the hype, it's mildly entertaining at best. People who review it online give it a grade of about a "C." The biggest complaints are the "ghastly" admission price and the fact that tour groups are too big (and sometimes have to crowd into tiny rooms). Check the reviews on Yelp. We polled more than 1600 of our readers to see what they think about the Winchester Mystery House. Among them. 66 percent said it's great or even awesome. 23 percent give it the lowest ratings. The rest think it's mediocre. 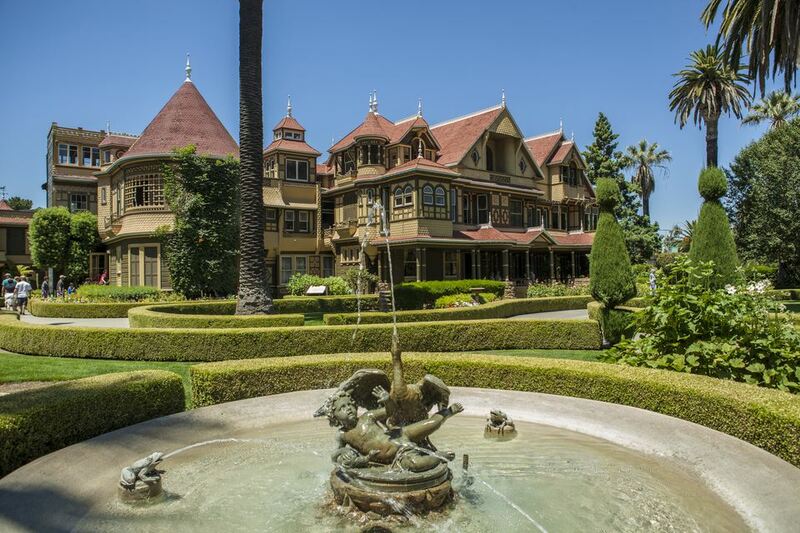 Where is the Winchester Mystery House? The Winchester Mystery House is in San Jose, near the Santana Row and Valley Fair shopping centers, a few miles north of downtown. Is it haunted? It depends on who you ask. You can find out more about hauntings, studies, and debunkings in this guide. And if you're into the supernatural, you can find more of them in this guide to ghost tours and haunted places in California. You don't need reservations, except for special events like the Friday the 13th Flashlight Tours and Halloween tours. The big old house is neither air conditioned nor hearted. It can be hot in the summer and cold in the winter. The stairs shown above look weird, but they're that way for a reason. Sarah Winchester was a very short woman who had trouble climbing normally-spaced stairs, so she put in these wide, shallow ones instead. But the Winchester House's oddest features — and the ones that visitors like the most — are the weird little leftover bits of its construction. Much of it seems to have come from Winchester's nightly consultations with her spirits — who obviously changed their minds on a regular basis. Among the oddities, you'll find the so-called Door to Nowhere, which literally leads to nowhere. It doesn't even open. Another door was boarded up one side of a wall, but not removed from the other. Then there's the Stairway to Nowhere, which now leads up into a ceiling. It was one of many designs that were changed overnight by owner Sarah Winchester. Winchester's fascination with the number thirteen is evident everywhere: bathroom number 13 has thirteen windows, one of them looking into the bedroom next door. The kitchen sink sports thirteen drain holes. Winchester even modified a twelve-light gas chandelier to hold thirteen lights. A beautiful Tiffany stained glass window that Winchester designed has thirteen jewels in the design. It sits in storage, never installed, along with many other pieces of stained glass in what tour guides call the $25,000 room. It's easy to lose sight of the fact that San Jose's Winchester Mystery House is a nice example of Victorian-style design. This view over the roofs brings that point back into focus. It's also easy to see just how big this house really is in this photo. Growing without an overall plan and seemingly at random, the Winchester Mystery House swallowed up everything around it, including the barn and water tower. By the time it was finished, it had 160 rooms, 13 bathrooms, 6 kitchens, 40 staircases, 47 fireplaces, 2,000 doors and 10,000 windows. The finished house covers 24,000 square feet on six acres. Not as big as Bill Gates' 66,000 square foot home, but enormous nevertheless. In 1884, Sarah Lockwood Pardee Winchester moved to San Jose, California. She was the widow of William Winchester of the Winchester Repeating Arms Company who had a $20 million cash inheritance and a $1,000-a-day income. She came to California on the advice of a psychic who told her the deaths of her husband and child were revenge from the ghosts of people killed by Winchester rifles. The only way to escape the spirits' wrath was to move west and build a house that would never be finished — or so the psychic said. Sarah spent more than $5 million building and rebuilding the bizarre Winchester House, but it didn't ensure her immortality. She died in her sleep on September 5, 1922. Construction stopped abruptly. Some say the carpenters were so happy to be done that they stopped without even hammering in the nail they were working on. Even if she believed that the building would help her live forever, Winchester had a contingency plan: a will written in thirteen parts and signed times. She provided for some of her servants, left her furniture to her niece and said nothing about the building she had spent so much of her energy on. The niece sold most of the furniture, which was carried away by the truckload: eight truckloads a day for six and a half weeks. The Winchester House was sold and turned into the tourist attraction it is today. If you want to know more about this unusual woman, you can read her biography on the Winchester House website. Some rooms actually got finished. Like this one, which has some furniture in it and has walls that are intact. You'll also see a lof of rooms that look like this, with walls and floors half finished. It's not vandalism — the house has never stood unoccupied. Instead, it's the result of frequent and abrupt changes of plan, which happened almost night. And, when Winchester died, the builders stopped and walked away. This photo is a rare look at the lovely Victorian details on the Winchester Mystery House. When I visited the Winchester House years ago and someone asked if it was haunted, my tour guide quickly replied no. Nowadays, it seems they have embraced the idea of ghosts and other paranormal phenomena and even report "alleged" hauntings on their website. Sarah Winchester was the first to report spirits in the house. In fact, she spoke to them nightly, ringing a bell at midnight to summon them. A second bell run at 2:00 a.m. told them it was time to leave. However, it seems that someone might need to ring a bell around the place again. The unusual goings-on reported in the Winchester House include organ music in the Blue Room where Sarah died, a couple lingering in the corner of a bedroom, cold spots in Sarah's bedroom, and apparitions of Sarah. Perhaps one of the oddest is the smell of chicken soup coming from a long-unused kitchen. Since Sarah Winchester's death, several psychics have reported feeling cold spots and seeing red balls of light that fade and explode. Psychic Jeanne Borgen visited in 1975 and reportedly took on Sarah Winchester's appearance for a short time. Authors Richard Winer and Nancy Osborn spent the night there in 1979 while researching a book and were awakened by footsteps and piano music. Visitors and employees regularly report their experiences at their website. Staff members have also reported seeing apparitions, hearing whispering sounds, seeing lights going on and off and security alarms being triggered from inside the house.